This delightful apartment set amidst verdant countryside surroundings is set on a family-friendly holiday resort near Durbuy. The resort provides an array of communal facilities including a playground, an outdoor swimming pool, an indoor swimming pool and Jacuzzi. Guests can also take advantage of the restaurant and launderette on site. This bright and functional holiday home has two bedrooms, providing comfortable accommodation for up to six guests. The open-plan kitchen, living and dining area makes for a functional and relaxed space to spend your holiday. Large windows bring in plenty of natural light, whilst the fireplace is a charming focal point during cooler months. Although the building is shared, each apartment has its own entrance. 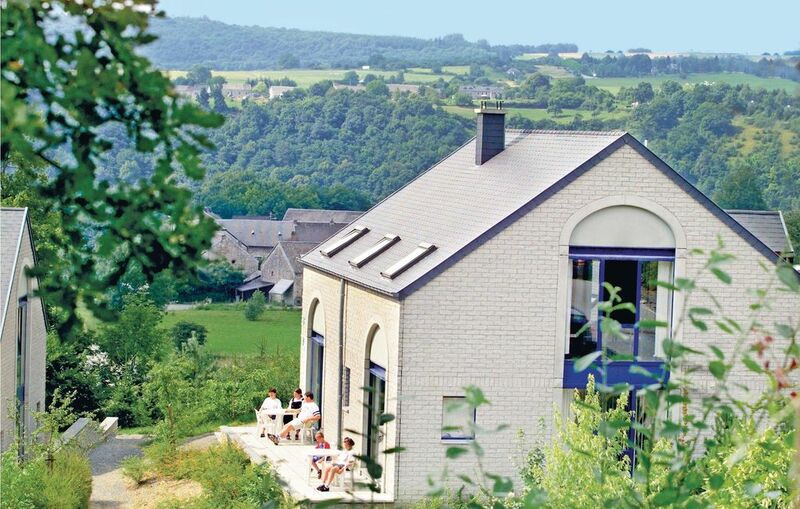 An excellent location for exciting activities, the Résidence Durbuy resort has the countryside on its doorstep. Water lovers can explore the nearby Ourthe River by kayak, whilst there are also several of hiking and cycling routes for active. N.B. Use of the outdoor pool is free of charge, open between July and the end of August. For youth groups – school groups or otherwise – the deposit for the apartment may be higher. Beds can be made up and a cot and high chair can be ordered in advance for an additional fee.